Trouble sleeping? Distracting sounds? Need a relaxing break from a busy day? If you answered yes to any of those questions then Sleep Expert is for you! 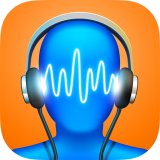 Sleep Expert is a professionally designed sleep support system, with 60 carefully selected, superb quality background sounds. Mix these sounds and create your personal sound atmosphere to help you fall asleep faster. Tap soundtrack icon to play it, tap again to stop it. Modify volume of the soundtrack with a slider inside icon. Get Sleep Expert app and forget sleepless nights..